The quality stainless steel Rocker Knife is extremely sharp and will cut through tough meat and thick vegetables while allowing you to exert notably less effort than conventional knives. 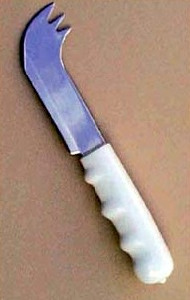 Featuring a sharp point at the end in conjunction with a bowed cutting edge, this knife is perfect for those suffering from Arthritis, recovering from a stroke or individuals with the use of only one hand. Traditional knives strain wrists by requiring you to push down while moving back and forth, but this knife rocks in one simple motion and does not necessitate a second utensil to hold or steady the food. 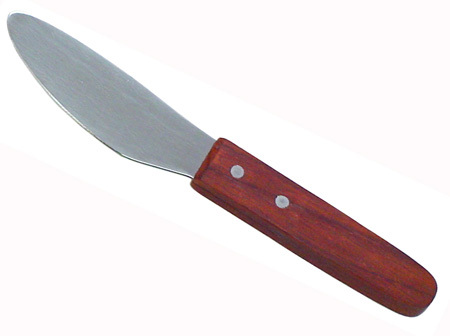 The knife weighs three ounces and is eight inches in length. Dishwasher safe. Not suitable for children. Please shop carefully, this product, for hygiene reasons, is not returnable.